Two years later, Brian rose to the challenge. He packed his rucksack, laced up his walking-boots and set off to make the journey in reverse. 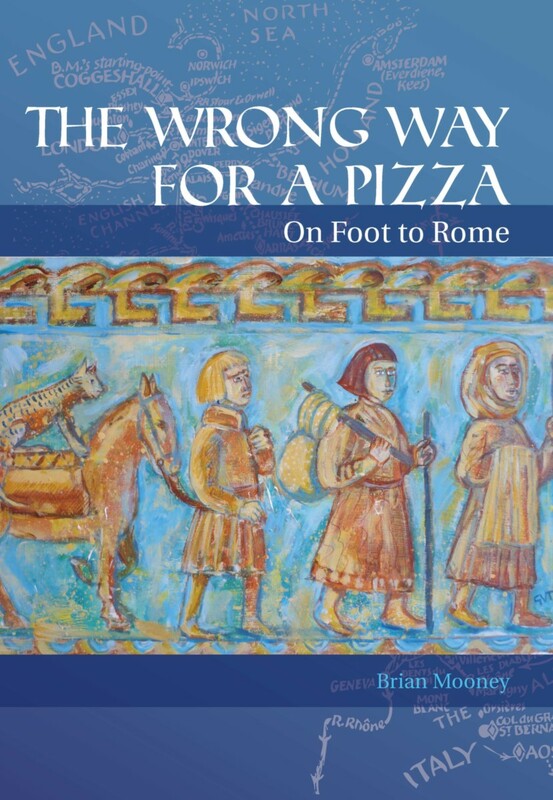 The Wrong Way for a Pizza is the account of his ten-week walk from the banks of the Tiber to the banks of the Blackwater – a mirror-image of A Long Way for a Pizza, the book he wrote after he walked to Rome in 2010. The author keeps bumping into the ghosts of his outward journey. He gets used to being told by Rome-bound pilgrims that he is walking backwards, and, with the sun behind him lighting up the Tuscan landscape, he revels in different vistas and new horizons. Varying the route from his outward journey, he crosses the Alps over a high pass from Cervinia to Zermatt and makes his way across the Jura to the Doubs, and then follows the Burgundy Canal to the Yonne and Seine, and on to Paris. After a fast march to Calais and a ferry to Dover, his arrival in Canterbury is greeted by a wall of indifference, but he finds a warmer welcome in the Essex new town of Basildon, where he spends the final night of his journey – although he cannot help reflecting that Basildon is not quite the Eternal City to which he has now walked there and back. “Brian Mooney blazes a trail northward across Europe like the summer swallow—a most enjoyable tale filled with character and determination, worthy of Saint Augustine himself." Brian Mooney is a prize-winning international journalist and author of three books. He worked for Reuters for 30 years, covering events in more than 50 countries. He was nominated for a Pulitzer Prize and awarded an American Press Club Award for his work in Poland during the Solidarity Revolution. In recent years he has worked in high-profile international PR assignments in Russia, Bangladesh and India. He has published: Breaking News (Wiley), a business book about the near-collapse of Reuters; Frontier Country (Thorogood), a light-hearted account of a walk around the borders of Essex; A Long Way for a Pizza and Shaping History (Arcturus), a study of great leaders.